﻿ Kinzie Hotel, Chicago (IL) | FROM $101 - SAVE ON AGODA! Have a question for Kinzie Hotel? 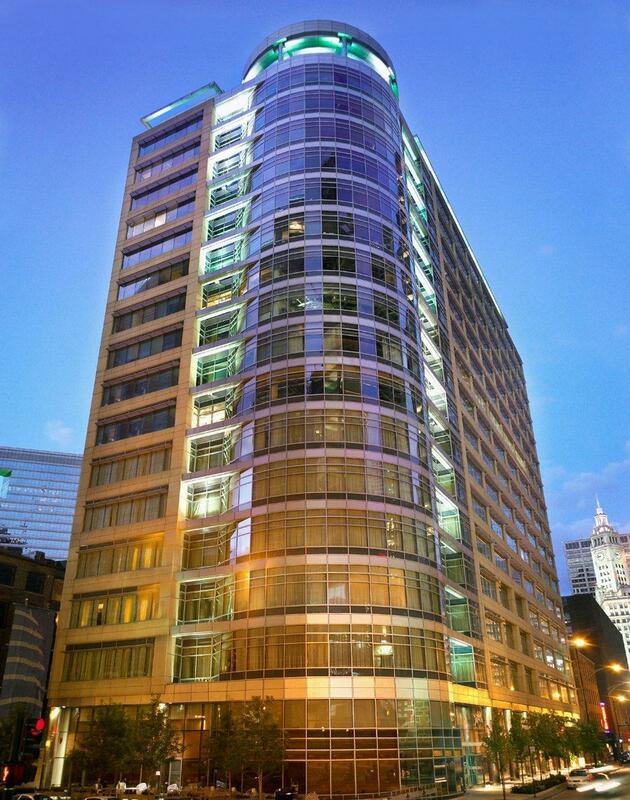 "We were very impressed with the value and quality of our stay at The Kinzie." "Added to that, the staff are live;"
"The staff is friendly and professional and the facilities are attractive." "Location is convenient, room very spacious, hotel staff frie..."
Kinzie Hotel, located in River North, Chicago (IL), is a popular choice for travelers. From here, guests can enjoy easy access to all that the lively city has to offer. With its convenient location, the hotel offers easy access to the city's must-see destinations. The facilities and services provided by Kinzie Hotel ensure a pleasant stay for guests. To name a few of the hotel's facilities, there are 24-hour front desk, facilities for disabled guests, express check-in/check-out, luggage storage, Wi-Fi in public areas. All guest accommodations feature thoughtful amenities to ensure an unparalleled sense of comfort. The hotel offers many unique recreational opportunities such as fitness center, massage. Kinzie Hotel is your one-stop destination for quality hotel accommodations in Chicago (IL). "Food, entertainment, convenience and grocery stores, and the..."
You must show a valid photo ID and credit card upon check-in. Please note that all special requests cannot be guaranteed and are subject to availability upon check-in. Additional charges may apply. Please note there is a 1 night room and tax penalty for reservations shortened after check-in. On certain group reservations or special discounted rates, a different policy may apply. Guests under the age of 21 can only check in with a parent or official guardian. Guests are required to provide a deposit via credit card upon arrival at check-in; the amount on hold is released in full if there are no incidental charges after check-out. Please note an additional 10.25% tax will be applied to the resort fee and is not included in the booked rate. The additional 10.25% tax will be collected upon check-in. With tax, the total resort fee is USD 16.48. The mandatory resort fee per day per room includes: -complimentary continental breakfast -unlimited WiFi access -24-hour fitness centre access -use of the business centre. When using a debit card attached to a bank or checking account, funds are immediately frozen for the full expected amount of your room charges, including estimated incidentals of USD 100 per night. This amount is released by the hotel upon check-out; however, the funds may not be available for approximately 7 to 10 business days, depending on bank policy. If the processing time is of concern, the hotel encourages the use of a credit card or cash for your stay. Guests are required to show a photo identification and credit card upon check-in. Please note that all Special Requests are subject to availability and additional charges may apply. A wonderfully located hotel to explore Chicago, with excellent facilities. Friendly helpful staff. Totally let down by poor cleaning-the carpets in the bedroom desperately need to be vacuumed, especially under the base cover. Thank you very much for your amazing comments and rating about our staff service and the location. This is highly appreciated. We thank you for the constructive feedback in regards to the rooms and will ensure to act upon this. Thank you very much, Terry. We are delighted that you had great value for money at the Kinzie Hotel and enjoyed your stay. Thank you for the ten out of ten. Pro: Relatively good location, close to everything. Really clean, comfortable, and quiet room with extras, . Also a good discount at the nearby restaurant/bar. Nice large windows. The staff was really nice and friendly and always available to help. Cons: The room pictured for the deluxe king is not the same room AT ALL, it’s actually the suite. The view isn’t great, you just see other buildings (but that’s somewhat expected). The breakfast was standard continental breakfast. We appreciate your review and your candid feedback about your stay. We are delighted that you were able to enjoy the city and the great discount at Public House next door. Thank you for kind words about the staff service, Aaron. We hope upon your return visit that we can tailor a specific room selection for you. We loved this cute hotel. It's a great location and the room was clean, the bed was comfortable, the staff was wonderful. Thank you for your amazing review and recommendation. This is a very lovely piece of feedback and we are very pleased.We are so glad you enjoyed Kinzie! Thank you very much for sharing this amazing feedback online for fellow travellers. We love that you found the Kinzie Hotel had everything you need for a great stay in an amazing part of the city. Dear Diana, Thank you very much for your amazing review. We love the full marks and appreciate your honest feedback. We are delighted that you would recommend the Kinzie Hotel. Thank you again. Needs better breakfast food options. Thank you very much, Elijah, for your wonderful review. We are delighted you enjoyed a comfortable and spacious stay at the Kinzie Hotel. Chicago Starts Here! We appreciate your kind words about our hotel team. My stay at The Kinzie was surprisingly pleasant from beginning to end. I think my favorite thing is it is in the heart of downtown Chicago but not on the busiest street. We were able to get much needed rest. Food, entertainment, convenience and grocery stores, and the reason I went in the first place- the Spanish Consulate- are all in walking distance. The staff is friendly and professional and the facilities are attractive. Great value!! We are delighted to hear that the Kinzie Hotel was perfect for your visit and you were able to get in your most important function as well as some of the other areas hot spots. We love our central location which makes it easy to get anywhere in town. Thank you for this very positive review and your feedback for other travellers on the great value. We appreciate it. We booked through agoda and paid in advance to guarantee the rate. The morning of checkout we have an invoice for $27 under the door. I went to ask about it, and they said it was a resort fee for WiFi, continental breakfast, business rooms and the gym. The booking stayed a FREE breakfast, and we didn’t have a need for any of the other services. We were also not provided any login info for the WiFi and figured we had to pay when we couldn’t connect. Then to find out that we paid for it was very disappointing. When asking to have the fee waived, we were refused. Very disappointed. Dear TJ, Thank you for choosing the Kinzie Hotel for your recent trip to Chicago. I am sorry that your stay ended in disappointment. We disclosed your Nightly Service Fee in your confirmation letters. I do apologize if this was unclear to you at the time of booking. The Nightly Service Fee provides many amenities including: unlimited wine and craft beer every night, Continental breakfast every morning, 24-hour access to our fitness and business centers. We also have upgraded entertainment allowing you to access streaming media such as NetFlix along with Wi-Fi access. All of this is provided for $24.95 per evening when booking with a third-party and $14.95 per evening when booking directly with the hotel. I apologize that you were not made aware of the Wi-Fi. Every guest is provided with the Wi-Fi access code when presented with their keys. I do hope we have the opportunity to restore your faith in our service in the near future. Thank you very much for your amazing review! We love the fact that we only have the short elevator wait times, this is a great bonus. We love that you enjoyed a great time at Kinzie and we hope you return. Thank you very much for this amazing review and the comments about our service and spacious rooms. We appreciate your feedback regarding the breakfast area and will review this with out leadership team to enhance our offerings. Thank you for this amazing review. We are delighted that you enjoyed the Kinzie Coins and that the team was very friendly! We were very impressed with the value and quality of our stay at The Kinzie. Added to that, the staff are live;y and very helpful. We’d highly recommend if you need a central, good value stay for a few nights. Thank you very much for posting your recommendation of the Kinzie Hotel online for fellow international travellers. We really appreciate your kind words and hope you had a pleasant trip back to England. Warmest Regards! Thank you for an amazing review. We are delighted your enjoyed a very friendly stay and five-star information. Our Concierge team want to make you even more comfortable when travelling and can certainly suggestion laundry options close by. We are very pleased you had a comfortable rest at the Kinzie Hotel. Location is convenient, room very spacious, hotel staff friendly; particularly like the 24-hour fitness centre although the space is a little confined. Would be more perfect if breakfast has hot dish options. Dear Wai, Thank you very much for posting this great review of the Kinzie Hotel. We are delighted that you have shared this with fellow travellers and that you enjoyed the location and friendly Concierge team. We do offer twenty four hour fitness and business centre access in addition to continental breakfast included, a Manager's Reception with beverages included and lightening fast fibre-optic WiFi with unlimited streaming. We appreciate your feedback. Thank you very much for your kind review. We are delighted that you enjoyed the manager's reception and a helpful reception. We really appreciate your high praise. Thank you very much, Ian, for your amazing review. We are glad you enjoyed the Manager's Reception and included Continental breakfast. You are right; there are thousands of pub options in the city and our Concierge team would be delighted to set you up with the best options. Please visit Kinzie again. Kristen, thank you for this amazing review of Kinzie. We are delighted you enjoyed an awesome stay and we hope you return to us. Bradley, we are delighted you enjoyed your Kinzie stay and gave us full marks. Our Mobile Concierge service is an excellent addition to assist us with guest requests. Thank you! The atmosphere was wonderful and I loved the fact that I could text the front desk. We are delighted that you enjoyed the Mobile Concierge texting service. We hope to see you again at the Kinzie Hotel.